is on a shelf above the Mattertal. It is very pleasant to bide a wee in Grächen but it is also an important staging point for other trips. post bus up to Grächen or the 1 hr walk up (see this link for the walk). You can also do the stiffer 2.5 hr walk up from Stalden (an earlier train stop on the BVZ) on this link. 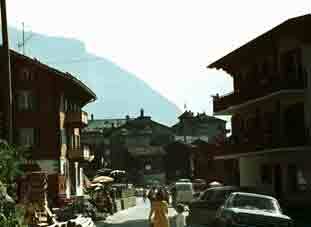 100 metre slog above the village or the Hotel Alpha, when it is necessary to be in the village. There are many other hotel options. I have done all these walks myself. For wintry types, there is some skiing, but I have not done any here. Hit this link to e-mail the village tourist office. Grächen from the Heidnische Tossen, on the walk down from the Wannihorn. 1970. It's grown a bit since. 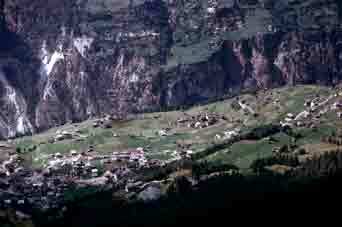 This is the Grächen Hannigalp. There are lots of Hannigalps! A gentle walk from the village up past the Hotel Zum See & throught the woods for most of the way. 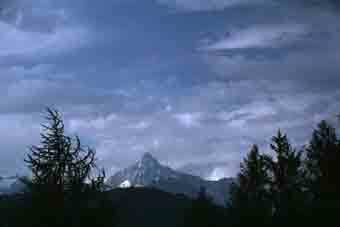 There is skiing here in the winter and magnificent views north to the Berner Oberland. South. the ridge continues to the Balfrin but non-rock climbers will get little further! The beautiful Brunegghorn dominates to the West. 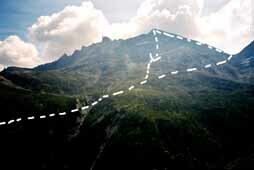 For an extended walk, go up the path in front of the cafe to the ridge above the meadow & head South over the Kleine Furgge & Grosse Furgge to the Wannihorn 2669m (or Wannenhorn on some maps). There is a different path back down to the village from there through the Heidnisch Tossen. 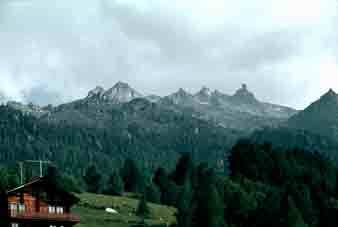 Alternatively, from the Hannig Alp, drop down the ridge to the café Hohtschuggen, hidden (but signposted) in the woods for tea & return to Grächen village by a more-or-less contour path. The Brunegghorn 3838m from the ridge. This beautiful hill dominates the area. Heading off southward in the woods from the Zum See & above, are irrigation channels (this is the driest Swiss village) dug along the contours, with paths on their downhill side. It is delightful & easy to walk along these, enjoy the views to the West & North and observe the wild life. There are still red (almost black) squirrels here. 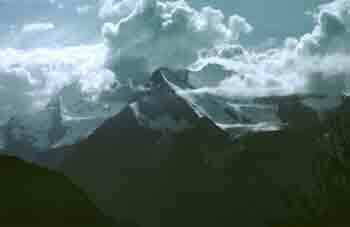 An evening view of the Bietschhorn in the Berner Oberland from the water track. Gabelhorn 3136m, which is a hard rock climb. 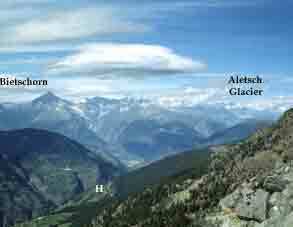 The Plattehorn (see below) is hidden by the Gabelhorn. 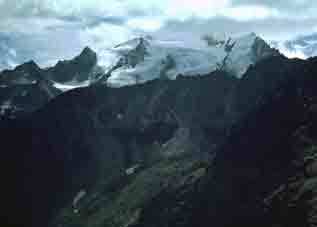 The Ried Glacier from Heidnisch Tossen. Go up the path towards the Hannigalp & take the obvious path South at point 1780 (the one you come down from the Wannihorn) about 200m past the Hotel Zum See. Keep going upwards (signpost for Heidnich Tossen at Lowizig) for about 4.5 km to the Ferichlücke 2886m, a pass below the ferocious North Face of the Ferichhorn. Ignore this (!) 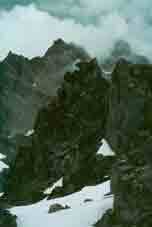 & turn North up the ridge over large blocks of stone to the Plattehorn summit, 3246m. The views should be even more open than from the Wannihorn but it was a filthy day when I went up, using it as a training walk for harder things to come. There is no need to go back to the Ferichlucke to get down. Head due West over the untracked rubble back to the path you came up on. 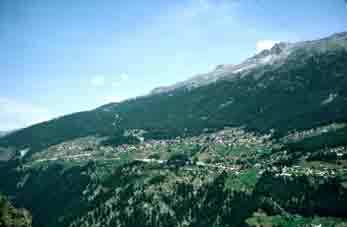 The Balfrin Hoheweg to Saas Fee is an attractive but quite tough back-packing way out of Grächen (or into Grächen from Saas Fee or Grund. I have done it both ways). This is a stage on the Monte Rose Rundtour. See this link. 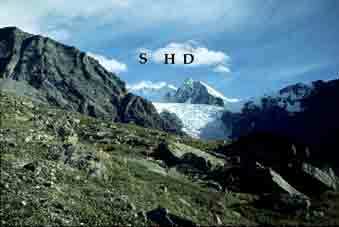 staying in the Bordier Hut, before continuing to the Mischabel Hut & Saas-Fee or combine these two trips. See this link. There is a high-level footpath to Zermatt called the Europaweg, part of the Chamonix-Zermatt walk & a long & hard 2 days, on this link. Not for the faint-hearted! Last revised 22/11/2010 © 1998-2010 Ken Baldry. All rights reserved.